– The time complexity of zadd() and zcount() is O(log(N)) in sorted set. – Additionally, we can also get the last active time of a logged-in user by invoking zrank() of which time complexity is O(log(N)). – Relatively large cost of memory. – The expired records need to be removed by cron tasks or asynchronous jobs. 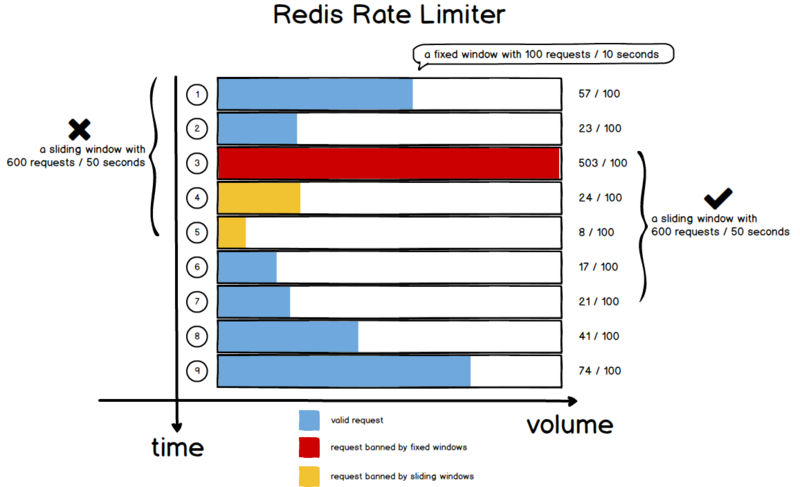 This rate limiter contains two parts: a fixed window policy and a sliding window policy. The fixed window policy maintains a key-value pair represents how many requests we received within a fixed period of time. e.g., the fixed window policy of 10 seconds can be easily described as <CURRENT_TIMESTAMP> / 10 => <COUNTER>. The sliding window policy is a bit more complicated: we need to sum up recent N fixed window’s value and compare the result with our sliding window policy. Similarly, if the sliding window size is larger than the sliding window policy allows, current request would fail. A Simple Priority Queue can be implemented by Sorted Sets. 127.0.0.1:6379[<span data-mce-type="bookmark" style="display: inline-block; width: 0px; overflow: hidden; line-height: 0;" class="mce_SELRES_start"></span>10]> zadd hackers 1940 "Alan Kay"
127.0.0.1:6379> zadd hackers 1957 "Sophie Wilson"
127.0.0.1:6379> zadd hackers 1953 "Richard Stallman"
127.0.0.1:6379> zadd hackers 1949 "Anita Borg"
127.0.0.1:6379> zadd hackers 1965 "Yukihiro Matsumoto"
127.0.0.1:6379> zadd hackers 1914 "Hedy Lamarr"
127.0.0.1:6379> zadd hackers 1916 "Claude Shannon"
127.0.0.1:6379> zadd hackers 1969 "Linus Torvalds"
127.0.0.1:6379> zadd hackers 1912 "Alan Turing"
127.0.0.1:6379> ZREM hackers "Linus Torvalds"